Television has become an important part of our lives. It has turned out to be one of the best ways to entertain you without having to go out. From watching your favourite TV shows to getting the news of the world, you can do it all with the help of your TV. All you need is just a cable subscription to watch your shows in the way you like it. Incidentally, that’s not entirely true. With the increased popularity of cable channels, most people consider the antennas as the relics from the past. But that is not the case. Still today several popular broadcast stations transmit their signals for people to pick up without the hassle of any cable subscription. You just need an HD antenna to pick these signals up and enjoy your favourite shows. Fosmon is really a popular name in the world of electronics. Hence, there is no wonder that this Fosmon indoor HDTV antenna made it to our list. This antenna comes with a 25 miles or 40Km signal range. Therefore, it can easily catch the signals that have been broadcasted from long distance. Plus, it also comes with retractable rabbit-eared dipoles which you can easily adjust to get the signals. Above all, the antenna comes with a 5ft cable which helps you to place the antenna in proper place for getting optimum signal strength. Bring home this antenna; get rid of the hazards of a cable subscription and enjoy your shows in HD. 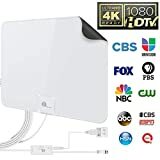 Here is another incredible indoor HD TV antenna in our list. This antenna from Leelbox has a unique razor sharp flat design. Thus, it catches the signal in a much more efficient way and you will never have to worry about signal loss. Furthermore, it has a 50-60miles signal range which means it can really capture long distant signals from broadcasting stations. Lastly, the Leelbox HD TV antenna comes with a 16.5ft cable which enables you to set it in a suitable position to receive strongest signals. Just connect the antenna to your TV and scan for the channels. Yes, that is all it takes to set up the antenna. 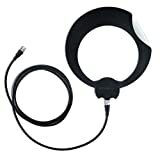 The Mohu Leaf Metro TV antenna is really a unique inclusion in our list. It has a small leaf-shaped design and still it provides you with strongest signals. The best thing about this antenna is that you do not need to point it in a particular direction to get proper signals. 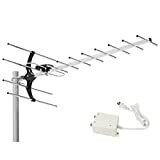 Just place the antenna in a suitable place and connect the 10ft long cable with your TV to get started with the free channels. It uses the US military technology which enables it to pick up any broadcast signal within a 25miles radius. Moreover, it is easily paintable to match any home decor. 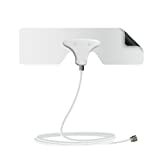 Well, here is another great indoor TV antenna from Mohu. This antenna has a thin paper-like structure and it is no less than the last entry in our list. With a 25-miles signal range, this antenna can easily pickup the signals without any problem. And you will never have to place it in any specific direction to get the best signal. 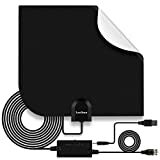 Just place it in any suitable place of your choice and connect the antenna to the TV using the 10ft long cable to enjoy your beloved shows. The first thing that is needed to be mentioned about this indoor antenna is its design. 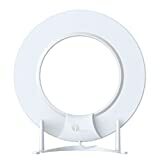 The 1byOne HDTV digital antenna comes with an exhilarant circular hollow design. The circular design does not only make the antenna look great but it also adds up to its signal capturing capacity. Having a 35-miles signal capturing radius, it can easily pick up the signals from the broadcasting stations. It is very light in weight and extremely easy to set up. Thus, you will be able to get your favourite channels in HD with 1byOne HDTV digital antenna. Well, this is really a powerful one. It comes with a signal range of 85 miles. Therefore, it can easily pick up signals from very long distances with ease. Moreover, this antenna assures you about providing full HD quality picture and best Dolby digital quality sound. Plus, it comes with 12 months warranty. So, just install it in your home and connect the cable to your TV to have the best viewing experience. This antenna comes with a 35-miles signal range. So, you will never have to worry about not receiving signals. Furthermore, it comes with a multidirectional element. Thus, you will never have to worry about pointing it to any particular direction. The antenna also comes with a 12ft cable thus you can easily place it anywhere without any worries. Lastly, the antenna comes with a paintable surface to go with the interior decor and the sure grip technology that it uses to ensure that the antenna can be easily attached to any surface. 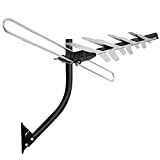 Well, it seems that 1byOne has some of the best HDTV antennas. This one comes with an 80-miles signal range which helps you to capture long-range signals. The antenna assures you to provide DOLBY Digital sound and full HD picture; so that you can enjoy your shows without any hazard. 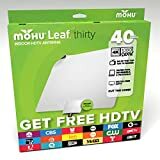 The Mohu 30 Leaf antenna is surely a special one. It has a thin paper like shape design thus it can capture the signals efficiently from any direction. Moreover, it uses a technology developed by US military that increases its efficiency to manifolds. With a 30-miles signal range and a 10ft power cable to help you place it at any place, the Mohu leaf 30 HDTV antenna truly proves itself worthy of securing the second position in our list. Well, this 1byOne HDTV antenna sits atop our list and that is for a reason. It is the best one that you can think of buying. The antenna comes with a 50-miles signal range and a 20 ft cable that allows it to be placed at any place. Furthermore, it has a unique thin razor like structure which does not only allow it to capture signals from all directions but also gives it a classy look. Get this antenna today and watch your shows in full HD without any hindrance. So enjoy the shows by installing the antennas and have a relaxing it. You can surely watch your favourite shows without any unwanted glitches with the help of these antennas. Waiting for what? Pick the best one and continue watching your series, films or any shows.